Shovelers are known by their long spoon-shaped bill which has earned them the nickname of "spoonbills." 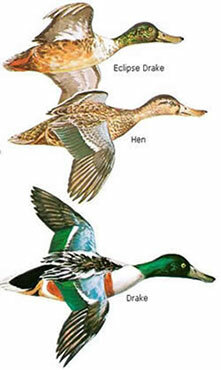 The drake has a bright green head and chestnut flanks. Shovelers have an average length of 19 1/2 inches and an average weight of 1 1/2 pounds. The largest numbers are in the Central and Pacific flyways. During the winter months shovelers inhabit South Carolina’s Coastal Plain region. 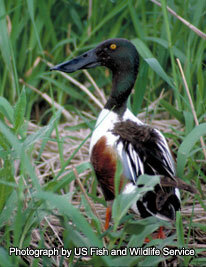 Shovelers prefer open, shallow wetlands with submergent vegetation. In the winter months they can be found in a wide range of wetland habitats including both fresh and saltwater marshes. Shovelers feed on a more specific diet then other ducks, consuming mostly small swimming invertebrates and some seeds. Unlike other dabblers, shovelers do not feed out of water. Breeding pairs form on the wintering grounds, generally later than other puddle ducks. Upon return to breeding grounds, the female selects the nest site and scrapes a nest bowl which is lined with down. Upon completion of the nest she lays 8-12 pale olive buff eggs. Drakes call woh-woh and took-took, and the hen's quack is feeble. Early migrants, moving out at the first frost. The usual flight is steady and direct. When startled, the small flocks twist and turn in the air like teal. The most territorial of the dabbling ducks, actively defending the core area of their home range during the breeding season. Form small flocks during the winter months.